Scud Heartless series 666 is designed to serve a different demographic. His vending machine is in hell. By a strange turn of events, his first and only customer is an angel, summoned by some of Hell's mischevious children. Just guess who his target is. Doug TenNapel, this issue's guest artist/writer, is the creator of Earthworm Jim and Dreamworks Interactive's The Neverhood. 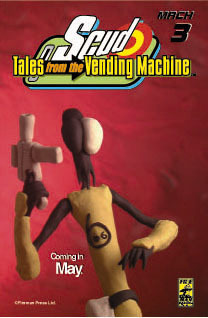 The cover boasts a three dimensional clay figure of Scud 666, sculpted and photographed by TenNapel.